An online presence is brilliant for any business, but why? 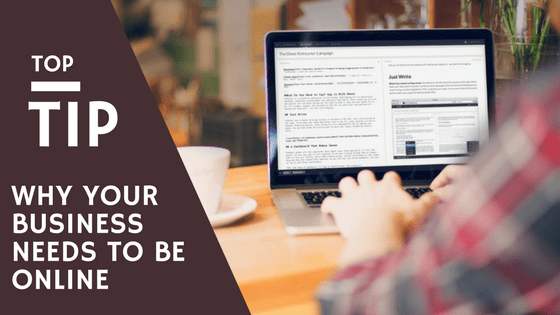 Every small business owner is advised to get an online presence – website, social media platform, Google My Business and a blog – but it is not always explained why. Other than it is great for your business, why else would an online presence help you? Let’s look at some statistics (as of 2016) and reasons why. Think of the amount of people you could be getting your business in front of. Even as a local business these statistics but you in front of more people than a newspaper ad or leaflet through the post box. Unlike traditional marketing methods having an online presence costs you nothing but time. Just an hour a day to interact with followers and schedule new content is cheaper than printing leaflets to reach the same amount of people. Of UK citizens that have a social media account 34 per cent and 28 per cent of Americans say they prefer to interact with a business who an online presence than visit a physical location. Why? Because lives are getting busier, people are spending more time rushing from one place to another they don’t have time to pop in to a physical shop as much. Not only that but when they discover a problem and require a need they want answers straight away, rather than putting it on a back burner and forgetting about it till later. People want answers NOW and being online gives you a far better chance to be in front of those customers when they need you. Staggering numbers of users who are interacting with businesses online. These users are always looking for new and better companies to make purchases from, for both services and products. Taking advantage of having an online presence will put you in front of these users and using eye catching, relevant content will show them why they should use your business instead of others. In November 2015, a user survey discovered that 60 per cent of users say they have found new brands through Instagram. Those figures alone have me looking in to using Pinterest for my own business. I use Pinterest to look for ideas for my kids birthday parties, and decorating the home. It is therefore understandable why having your business links on there will garner you more interest. I have seen many businesses comment in groups on Facebook about using Pinterest and getting the graphics correct but by the looks of it, the efforts are worth it. LinkedIn is primarily for business to business (B2B) interactions and hiring opportunities. These statistics do back up the primary purpose, and create a whole world for B2B businesses to grow their business, market their services and provide a platform to show off their expertise. 126 per cent more lead growth!! Although the source for these statistics suggests that blogging around 20 times a month will create that large increase in lead growth, a blog a week can start making a difference. Blog posts can include product reviews, how to posts, industry knowledge, and the occasional personal posts. Avoid posting ‘adverts’ selling your products over and over again, this will turn readers off and can be detrimental to your online presence. Just being on social media platforms and blogging can then get you noticed more in Google. They love active businesses who provide fresh content relevant to the keywords associated with their industry. Getting registered on Google My Business literally puts you on the map. If anyone is searching for businesses in your local area you will pop up on Google Maps, if they look for your industry in your area, you will pop up as a business listed on the maps. If they actually search for you, then your page, website and all your information then pops up on the side (as seen for RedRite in the image below). So there you have it, a few simple facts about why being online can have a huge impact on your business. Still unsure? Then give me a call, let me know what your business is and I can show you how being online will make a difference. Technology is always advancing and with new changes it can be hard to keep up with it all but as I mentioned earlier the effort is well worth it.